The Pumas scored four tries as they thrashed the Six Nations champions 20-43 with a display of pace and power in Cardiff that overwhelmed the Irish. This is the sixth quarter-final loss for Ireland and a repeat of the 1999 loss to the South Americans, leaving them as the tournament’s great under-achievers, possibly the biggest chokers. A brace from Juan Imhoff and 23 points from the outstanding Nicolas Sanchez set-up the victory. Joaquin Tuculet and Matias Moroni also got in on the act as Los Pumas ran riot. Ian Madigan’s boot kept Ireland within touching distance in the first half with ten points, while Luke Fitzgerald and Jordi Murphy scored a try each. Argentina are the third southern hemisphere team to qualify for the semi-finals. The game sparked into life from the kick-off and it was not long before Argentina were on the scoresheet. Fullback Tuculet regathered his own up-and-under, set-up the ruck before switching the play to the right. Juan Martin Fernandez Lobbe’s long floated pass took out Irish defenders, Santiago Cordero drew Rob Kearney and put Moroni into space to score. Sanchez’s wide conversion gave his side a 7-0 lead after five minutes. Ireland were all over the shop; the second try came when their scrum disintegrated on their own feed inside opposition half. From the resulting line-out Argentina went through the phases keeping the ball in hand, getting over the gain line and winning the collisions. Ireland had no answers for the pace of the South Americans’ play, particularly at the breakdown, where the Pumas quick ball was devastating. Argentina sent the ball wide, Cordero involved again put a chip-kick behind the on-rushing defenders for Imhoff to touch-down, 14-0 after ten minutes with another Sanchez conversion. Ireland were being run ragged and losing every key battle on the field. A penalty from Sanchez stretched the Pumas’ lead to 17 points in the opening 15 minutes. The Argentina juggernaut soon lost momentum when Ramiro Herrera was sent to the sin-bin for not using his arms in a tackle. Madigan’s penalty was good but cancelled out by Sanchez, who then missed an important penalty. From that Ireland took the ball up-field, Robbie Henshaw drifted past two defenders to send Fitzgerald – on for Tommy Bowe – through to score. 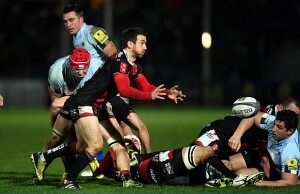 Madigan’s easy conversion reduced the deficit to ten points. The game was now helter-skelter but the Irish were in the ascendency at the break. The second half started in the same vain as the first, this time a break through two defenders by Fitzgerald set-up Murphy with an off-load to score his team’s second try. Madigan’s second conversion brought Ireland within three points. Both fly-halves traded penalties: 23-20 to the Pumas after 53 minutes. 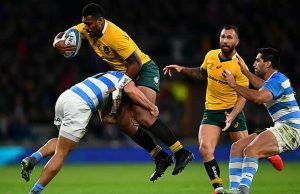 No side had ever come back from such a deficit in World Cup knock-out rugby but the men in green had given themselves a life-line with the help of their opponents’ ill-discipline. Argentina were leaking penalties as Ireland increased the pressure at the breakdown. Rory Best was immense in this department. However, Madigan had a chance to draw his team level on the hour but pushed another ruck-penalty wide. The benches were being emptied; fitness would be crucial in the end. Devin Toner was penalised for a high tackle on Sanchez, giving the stand-off his fourth penalty to extend their lead to six points. Going into the final 15 minutes both teams handling errors mounted as minds tired. Madigan kicked out on the full and Argentina wasted the opportunity. But three minutes later Murphy knocked-on at the base of an Irish scrum. 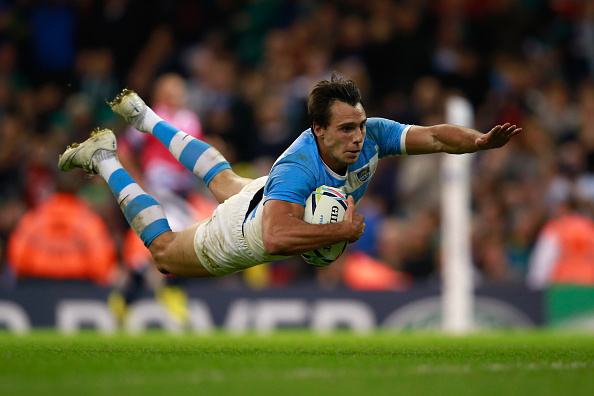 Los Pumas won a scrum-penalty advantage but went left on first-phase ball and scored in the corner through Tuculet. Sanchez’s third conversion put the game out of reach and Ireland out. There was still time for Imhoff to get a second after Lobbe’s surge up-field took out Irish defenders and off-load sent the wing over, giving Daniel Hourcade’s team a 20 point lead. Sanchez’s penalty was immaterial in the grand scheme of the Test but the result was emphatic. 15 Rob Kearney, 14 Tommy Bowe, 13 Keith Earls, 12 Robbie Henshaw, 11 Dave Kearney, 10 Ian Madigan, 9 Conor Murray; 8 Jamie Heaslip (captain), 7 Chris Henry, 6 Jordi Murphy, 5 Iain Henderson, 4 Devin Toner, 3 Mike Ross, 2 Rory Best, 1 Cian Healy. Replacements: 16 Richardt Strauss, 17 Jack McGrath, 18 Nathan White, 19 Donnacha Ryan, 20 Rhys Ruddock, 21 Eoin Reddan, 22 Paddy Jackson, 23 Luke Fitzgerald. 15 Joaquin Tuculet, 14 Santiago Cordero, 13 Matias Moroni, 12 Juan Martin Hernández, 11 Juan Imhoff, 10 Nicolas Sanchez, 9 Martin Landajo, 8 Leonardo Senatore, 7 Juan Martin Fernandez Lobbe, 6 Pablo Matera, 5 Tomas Lavanini, 4 Guido Petti, 3 Ramiro Herrera, 2 Agustin Creevy (captain), 1 Marcos Ayerza. Replacements: 16 Julian Montoya, 17 Lucas Noguera, 18 Juan Pablo Orlandi, 19 Matias Alemanno, 20 Facundo Isa, 21 Tomas Cubelli, 22 Jeronimo De La Fuente, 23 Lucas Gonzalez Amorosino.